Will you find middle ground? 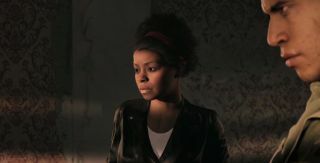 Although we were briefly introduced to Haitian Syndicate leader Cassandra last week, Mafia 3’s latest Inside Look video details the somewhat tumultuous relationship she shares with protagonist Lincoln—and how the unlikely partnership could help and hinder both parties. We learn that the “Voodoo Queen”, as Cassandra’s otherwise known, has a separate agenda to Lincoln but that a shared goal by way of common enemies pulls the pair together. I guess we’ll find out either way come Mafia 3’s release on October 7. Until then, check out Dave Houghton’s hands-on, or have a gander at 20 minutes of in-game footage.